We had a great time in the run up to Christmas, with all sections taking part in the youth Christmas Service and putting entries into the Festival of Christmas Trees. On our final Friday before Christmas, all sections enjoyed Christmas celebrations and left with sweets or selection boxes to tide them over the holidays! Thanks to all who supported our Christmas card delivery service this year. It was good to see an increase in the number of cards in the post sack this year and we were delighted to raise the sum of £146, some of which went towards the cost of our Christmas celebrations. Looking forward to 2019, we have four boys working on the final stages of their Queens' Badge work, and two boys who will hopefully have done enough to obtain their President's Badge by the time of our Display. We will be holding our coffee morning on Saturday 16th February, with information about ticket sales to follow in intimation sheets nearer the time. We do hope you'll be able to join us on the day. It is probably fair to say it has been a challenging session so far in terms of numbers of boys attending across all three sections, with numbers now a bit lower than they were a few years ago. 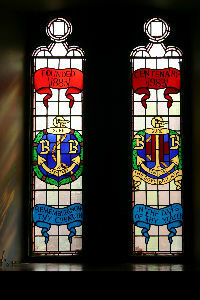 We pray that more boys will be led to our door and that our officers and leaders will be guided in offering a great programme of activities to those who join us.